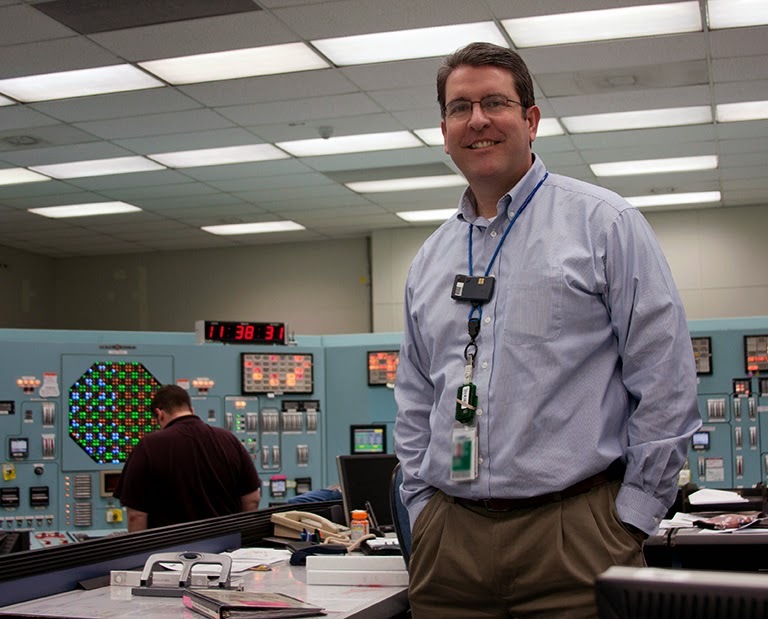 The following is a guest post by John Dobken, an employee of Energy Northwest who works at Columbia Generating Station in Washington state. If you wanted a loaded term, that’s it. It’s general enough to allow the person hearing it to conjure up whatever “near miss” scenario their imagination allows: two jumbo jets; two vehicles; maybe almost falling off a tall ladder. You get the point. What has been avoided is potentially catastrophic. So why then would an organization that supposedly prides itself as an authority on nuclear energy ascribe such a term to a federal agency that doesn’t even have it in its lexicon of regulation? Except that regarding Columbia Generating Station, that wasn’t the case. UCS wrote that Columbia had three “near misses” in 2013 because it had three special inspections. Contrary to UCS belief, special inspections do not equate to “near misses.” Two of the special inspections involved security-related issues in which no findings were identified and would not have affected core damage probabilities at all, certainly not by a factor of 10. Both of these issues were initially brought to the attention of the NRC by Energy Northwest, owner and operator of Columbia. The determination to conduct the third inspection was based on a calculated core damage probability. However, the assumption used in the calculation was later proven to be wrong and thus, the actual core damage probability did not change at all for the third event. In that light, these three incidents don’t even seem to reach the flawed threshold of UCS. Interesting. When asked about the use of the term “near miss,” the NRC has said that it is a “mischaracterization” of their regulatory regimen. However, if one has an agenda, such as UCS, then you use whatever information you can, in any way you can, even if it means misleading the public you are trying to sway. Enter the Oregon and Washington Physicians for Social Responsibility. Piggy-backing on their anti-nuclear energy brethren, they also take the made-up UCS term “near miss” and wrongly liken to it an actual NRC term “accident sequence precursor” (a term, presumably, UCS does not find sufficiently inflammatory). Remember, he doesn’t know what he is talking about. Literally, in this case, as security-related issues are rightly not divulged to the public. It is akin to your doctor advocating euthanasia simply because he heard you went to the emergency room a couple of times last year. Too harsh? Yes, any rational person would call that malpractice. Unfortunately, anti-nuclear energy activists cannot be sued for their negligent actions. But they can, and should be, ignored. I completely agree that there is no excuse for misleading language and every reason to promote accuracy in reporting. However, I do also think one must remember that the consequences of the UCS being wrong are of far less importance than the consequences of Columbia's staff being mistaken. Well, that illustrates another unfair double standard. Anti-nuclear whack jobs are never, ever held accountable for their lies and "misstatements". They can push as much FUD as they want without fear of retribution. As far as I know no one has ever held the former NRC Chairman, Whackjazko or whatever his name was, accountable for his fear-mongering about the Fukushima spent fuel pool being a "raging inferno", when nothing really ever was wrong with it, and very little if any damage was done to it. Yet a day never goes by without some anti-nuclear whack job accusing Tepco of "lying" when they really aren't. What we need to do is find someone who sustained a loss due to the miss-characterization and help them sue the "Physicians for Socialist Responses" into oblivion. Did someone NOT sell a house on the day of the article because a potential buyer read such tripe? We need SOMEONE who has sustained a loss. Are you certain that they can't be sued? There is the standard: absence of malice and if they cross that line, they can no longer claim free speech. It appears to me that you example of the UCS is an instance of crossing that line and deliberately misrepresenting the facts with malicious intent. It would be easier to prove malicious intent if it was part of the campaign to force the closure of the power plant. When and where did Jaczko ever say there was a "raging inferno" in the Unit 4 spent fuel pool? You have that phrase in your post as a direct quote. Jaczko inaccurately said the Unit 4 pool was drained of water, creating a risk of fire. I don't recall that he ever said there was in fact a fire underway, let alone that it was a "raging inferno." If Jaczko never said those words, aren't you committing the same offense you and JRT accuse nuclear opponents of? Deliberately misrepresenting the facts with malicious intent? Please provide a link to that Jaczko quote, if it's not just your libelous fabrication. Here's a link to the image of the memo to Jazcko, including claims of multiple Zr-H fires in the spent fuel pools and multiple deaths. All of that was pure fabrication. It is interesting sophistry to say that PSR doesn't know what it is talking about when it observed a pattern of behavior in having three special investigation teams (two for security reasons) visit the Columbia Generating Station nuclear power plant last year. Of course the security inspection details were kept secret, and for good reason. PSR noted that in its press statement. Having two of these special inspections for security reasons in one year can't be a good thing. Special inspections are triggered by situations that increase chances of core damage by a factor of ten. The NRC refers to these events as "accident sequence precursors." Having three of these in 2013, on the heels of a partially botched installation of new condenser modules (resulting in two lawsuits - one ongoing) and a seeming inability to operate functioning radiation sensors on their stack (after being placed on the degraded cornerstone list for a ten year failure to properly calibrate those sensors by the NRC in 2012) does appear to be a pattern of behavior. If this is considered standard operating procedure for a nuclear plant, that is not very reassuring to the public living downwind and downstream. Considering that this blog is moderated by the author, I doubt this post will see the light of day. I hope you prove me wrong on that score, if not on the other ones. That's all antis have to do! No need for truth or fact! Hit and run lies! Break the window with a rock and split and leave you repairing the public relations damage! The linked NRC memo was not sent to Jaczko. Nor was the phrase "raging inferno" used anywhere. Nor were Jaczko or NRC claiming there were such fires, let alone publicly. 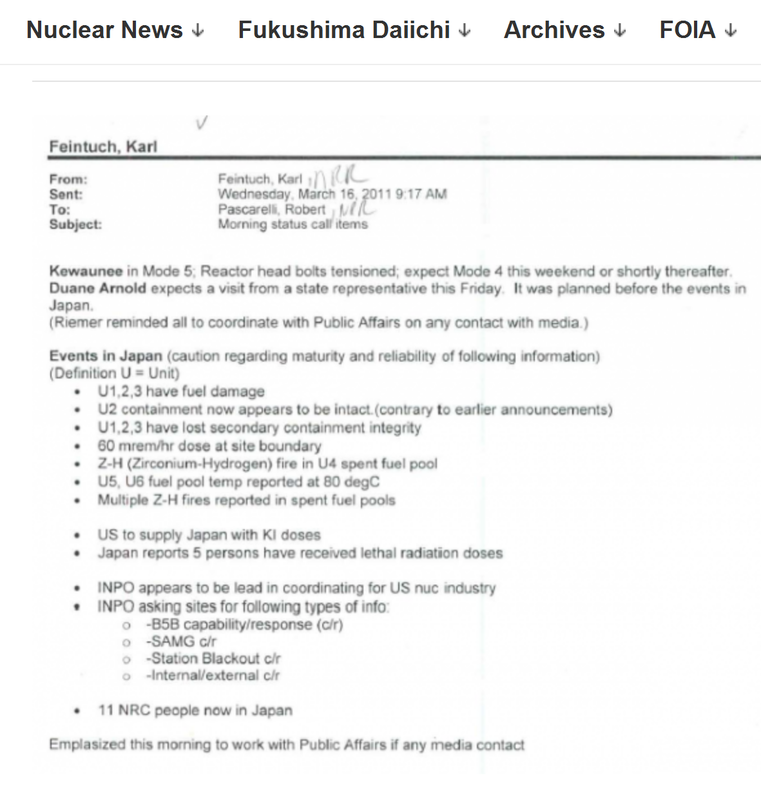 The linked memo is one NRC staffer summarizing what they were hearing from Japan in the early days of the accident. NRC was not saying it agreed with or had confirmed those reports. In fact, the memo explicitly says, "Caution regarding maturity and reliability of following information." Was your extreme misrepresentation of this memo done with malicious intent? If so, should Jaczko be allowed to sue you? Oh, shut up already with the threats of lawsuits and libel. We don't need your threats and challenges. Jaczko is a public figure. He's going to have a hard time proving malice based on postings in a lightly-read internet blog, even if there were mistaken attributions. The threat of libel also fails the legal test of harm done. Nobody is going to think any more or less of Greg Jaczko based on what is posted in an obscure internet blog. So take all your silly threats with a big dose of STFU. You know, you're beginning to remind me of the one guy who used to haunt the response pages of the Atomic Insights blog, Dr. Dr. Dr. John Miller, Ph.D., as he was called, who'd threaten anyone with a lawsuit as soon as he felt like he was being insulted. Got pretty old awful fast. Thanks for reading the post, Mr. Johnson. Since I covered nearly all your points in the original post, I will simply add this regarding the condenser replacement. You are aware Columbia had a record generation year in 2012, sending 9.4 million megawatt hours to the grid, in the first full year of operation after the condenser was replaced. Last year, Columbia also set a record for generation in a refueling outage year, sending 8.3 million megawatt hours to the grid. While I am honored to appear in this blog, I certainly don't moderate it. I leave that to the good people of NEI. "shut up already with the threats of lawsuits and libel." Three cheers for open discussion! I'm not threatening to sue anybody. I'm RESPONDING to and questioning earlier commentors on this thread, who said nuclear power opponents should be sued for making false statements. EXAMPLE: "What we need to do is find someone who sustained a loss due to the miss-characterization and help them sue the "Physicians for Socialist Responses" into oblivion." Then, out of the other side of their mouths, the posters themselves make false statements misrepresenting what opponents have said, apparently with malicious intent against the opponents. Like saying Jaczko said there was a "raging inferno" in the Unit 4 pool when he, nor anyone else at NRC, ever said any such thing. Then trying to claim NRC said there was a fire by posting a link to an NRC staff email detailing early reports out of Japan, which in the memo itself warned the info might not be reliable. Irony much, yes. I know the state chapters of Physicians for Social Responsibility, and Heart of America NW, and they are honorable, very knowledgeable people, who take their fact-checking seriously. I certainly trust them more than the attack dogs on this forum, with their lawsuit-happy nonsense.